Brexit: Lord Adonis joins the debate as public petition gathers pace. There are currently two petitions doing the rounds. One in favour of Revoking Article 50, and one to walk away now. 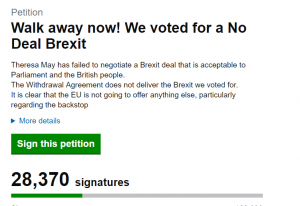 Both petitions began in response to recent developments in the seemingly endless Brexit negotiations. Regardless of which side of the debate you stand, passion is running high. Remainers believe that in light on the ongoing unrest and discord among the very people tasked with guiding the country, the only reasonable action is to put it back to the people. Would a clearer understanding of what is at stake, and realism of a no deal exit change people’s minds? Should the country walk away on the 29th March 2019 with no deal regardless of the consequence? After seeing the rapid escalation in signatures to the Revoke Article 50 petition Lord Adonis said via Twitter ‘I intend to move for the revocation of Article 50 in the House of Lords on Monday’. The Labour Party members tweet has been liked over 30,000 times and shared over 6.6 thousand times. This statement contrasts with the Prime Minister’s statement in which she stated she ‘will not countenance’ revoking Article 50. In addition, Lord Adonis will be appearing at St Aidan’s Church and Community Centre on Friday 22nd March and 18.30. 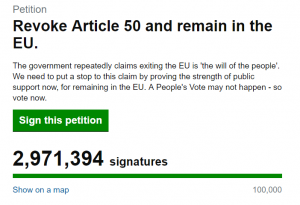 In the time taken to write this short piece the number of signatures gained for the Revoke Article 50 petition has risen to 3,153,370 and Walk Away Now! Remained at 28,370. The Salvation Army are appealing for help over the festive period. The aim is provide a glimmer of happiness to the those less fortunate over the Christmas period. The organisation works tirelessly all year round to provide care and companionship for the most vulnerable in society. This year there are several ways you can contribute. 1, Cook up some sweet treats for your friends and family: Bake sales are always popular. You can sell individual biscuits and cakes or make bags of festive truffles. Ideal for that secret Santa Gift. 3, Donate a gift: When you are shopping for the perfect gift for your nearest and dearest, put an extra gift in the basket and bring it to one of out collections points. Please give a thought to those less fortunate than yourself, who may not have anything to open on Christmas morning. A young person who lives on the streets, a family struggling to buy food, or an elderly person who may not speak to another person all day. If you are buying gifts please do not wrap them, the team can then see which age group and gender it will be most suitable for. They will then be distributed to those in need. 100 years after the guns fall silent, the world remembers the fallen hero’s of World War 1. For many Hull families their thoughts return to a sleepy French village. 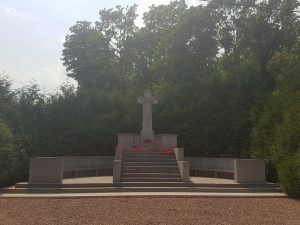 On 3rd May 1917 in a wood, north west of the village of Oppy, The German army had set up an observation station. The planned attach by British troops, would create a diversion drawing the enemy away from the primary target. In total 326 men would lose their lives may of which became known as the Hull Pals. 6,250 men from Hull answered the call and signed up to fight for King and Country. 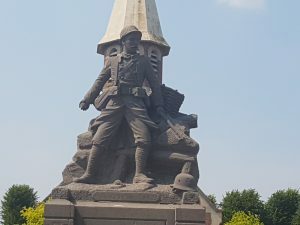 Hull as a city provided over 70,000 men overall to the cause. 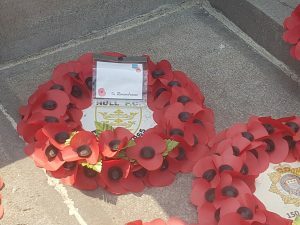 Of all those that gave the ultimate sacrifice one name appears over and over again…2nd Lieutenant John ‘Jack’ Harrison. Jack was an East Hull lad. He trained as a teacher at York St Johns and it was there his talent for rugby was uncovered. He was recruited to play for Hull FC in the 1912/13 season, his talent lit up the Boulevard. Following a stint in Suez Egypt, the 11th Battalion of the East Yorkshire Regiment arrived at the Somme. On 25th February 1917 2nd Lieutenant Harrison led his patrol into no-mans land. He was awarded the Military Cross (MC) for his actions. It was his actions on 3rd May 1917 that would lead to the machine guns falling silent . The attach to capture Oppy Wood had been ordered for dawn, however this was brought forward. The mistake was made to order the attack during the night. The moonlight cast shadows on the men exposing their location and the slaughter of many. It was his actions alone which silenced the guns and led to him posthumously being awarded the Victoria Cross ( VC). His boy was never found. For all student’s like myself this is the business end of the year. In the past I would have been of the mindset that there is still a couple of months before deadline and I could carry on plodding along with little if any worry about what’s to come. Those were the days when I could pull all nighters, then sleep for three days. Unfortunately these days that would probably kill me. The important thing is that it’s in my awareness so I can do something to change it. How can I make positive changes to make things happen? Some of the finding took me by surprise others not so much. The outcome was simple(ish) I need to be really organised and disciplined. There must be balance, and the acceptance that not all planning goes to plan. If it doesn’t, make adjustments and don’t give up. The one thing that I have found is by being brutally honest with myself I have been able to make lots of little changes that have made a world of difference. At the moment I am as organised as I can be for the mayhem that is coming, and that is a great place to be. Hull City Council Polling Districts and Polling Places consultation has been opened for public reaction today. As part the Local Government Boundary Commission for England’s plan to reduce the number of council ward’s. Under the current structure the city is divided into twenty-three section which are run by fifty-nine councillors’. Under the revised proposals the number of wards and councillors will both be reduced by two. Every ward in the city will be affected by the change. The number of electors per polling station which currently stands at 2500. The accessibility to the station for people with disabilities is also of great importance. Members of the electorate are encouraged to vote on the newly proposed ward’s with suggestions for improvement welcome. The process is overseen by the Acting Returning Officer who will present the results once the consultation period has closed on Friday 17th November 2017. The restructuring of ward boundaries form part of a greater parliamentary constituency reform which will see the number of MP’s across Yorkshire and Humberside reduced from fifty four to fifty. Electorates are encouraged to express their opinions and suggested amendments. The Acting Returning Officer will present the findings once the consolation period has ended on Friday 7th November 2017. The below image demonstrates the current council wards – click on image. The council ward restructure is linked to a Parliamentary constituency reduction seeing the number of MP’s in Yorkshire and the Humber being reduced from 54 to 50. The map of Hull Council’s wards are in the process of changing, Sarah Oughtibridge has been looking at what is happening and what it actually means for the people of the city. The plan to change Hull City Council wards is entering the final stages of negotiations. Between October 2016 and August 2017 three rounds of negotiations took place allowing both political parties and individuals the chance to make proposals for the change. The outcome was an agreed reduction in the number of wards from 23 to 21, and a reduction in the number of Councillors from 59 to 57. In a previous article Sarah looked into the final round of public consultations on polling districts. The next stage is for the proposals to go before parliament for final approval. Leader of the Council Stephen Brady said: ‘The Local Government Boundary Commission have made some significant recommendations regarding the wards in the city which are largely, but not wholly, based upon proposals drawn up by the Labour Group on Hull City Council’. This makes sense if you are familiar with local politics, but for the everyday Jackie or Joe on the street what does it all mean? Every town and city across the United Kingdom is broken down into council wards. Each ward is usually the same size and allocated three councillors, except in mixed urban and rural locations where there may only be one or two. The councillor’s role is to represent that area within the council. They are in many respects a performer who spins plates. Each plate is a different section of the community: residents, businesses, and community groups. There is also the political party to which they belong, and the council. Each of these entities is a plate and in-order to keep each spinning there are tweaks and adjustments which need to be made. If one was to fall the result could be a knock-on effect from one to the other each landing in a broken mess on the floor. When proposing changes it was important for the council to demonstrate to Parliament that ‘a good balance between community identity and electoral equality’ and been taken into account. In other word’s the council need to show that they recognise that Hull is becoming more and more diverse in its communities, and each has its own identity. This need to be carefully balanced with the number of people in an area that are able to vote. Like the councillor’s who spin the plates, the City Council leaders are also playing a balancing game but this time it’s even more tricky. They have a set amount of resources which need to be shared between the ward, and the trick is to get the balance right. Some area’s need help with housing, some need help with crime, whilst for others its the roads or community projects. By reducing the number of councillors that wages bill will be eased allowing that extra money to be re-allocated to other area’s which may be the little extra they need to help increase a much needed service. As students we all use the library. Like most I like to think that being half way through my second year, I’m pretty confident in finding the what I need. The simple answer is yes! He explained that research is not just about knowing where to look for information, its about the way you think about what you look for. Lateral thinking is key, along with organising what you find. After the class session I booked for a one and one meeting. I came out not only feeling positive about going forward, but excited. Here are some tips on starting the planning and organisation process. It allows you to keep your research organised. You can easily copy links of articles that interest you or quickly note a thought. Apps are available for all devices and online which sync up so no matter where you are, you can access what you need. 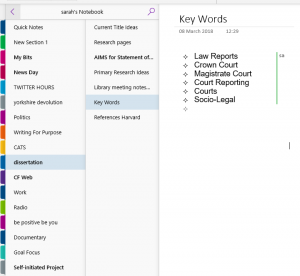 Make a note of key words to search for. This list should expand as your research grows. If there are words which keep coming up make a note of it. When using e-resources in the Uni library there will be the official Harvard citation available. At this early stage don’t dismiss anything. We are told time and time again that our initial idea and final piece of work will probably be quite different. The key will be to think laterally not literally. In reality there may not be exactly what you need, so break it down into sections then try and join the dots. It will also help with analysis. After seeing how much time my other half has given to his research, and speaking to my tutors start the research as soon as you can. There’s not way it can be done with only weeks to spare. The 7th of April saw Hull join a distinguished club including places such as New York, Portsmouth and Leeds. The 2017 City of Culture has been immortalised in the board game Monopoly. It seems almost surreal but instantly put a smile on the face of everyone buying it. Each coloured sections has been given a theme, for example the Pink section is for the three main sports teams Hull City AFC, Hull FC and Hull Kingston Rovers. Other themes include museums and festivals. The sought after blue tiles are reserved for The Humber Bridge and Hull City Hall. The main challenge when re-branding, is the ability to keep the identity and integrity of the original, but add something special to it that is different form the one’s which have gone before. The Hull version provides a familiarity with iconic landmarks from around the city. It has the potential to give a sense of ownership to the people playing it. The news room has made a video to allow you to see the potential of what is in store. It is a look at what is another big moment, in a big year for Hull. Everyone has a home town. Its the place you grow up, that shapes you and will always hold a little bit of your heart. I was born in York but Scarborough is where I grew up and will always feel like home. Archbishop of York Dr John Sentamu blessed the new nursery building of the Minster School. The building known as the ‘White House’ has been renovated and given a new lease of life. I attended the opening whilst on work experience at That’s York TV.